But I can grow a mean patch of pumpkins. Okay… Okay. Pumpkins are pretty easy to grow, so don’t be too impressed…But still… I’m going to take full advantage of my bragging rights. This year I poked a handful of heirloom pumpkin seeds into my hugelkultur bed, just to see what would happen. (If you’re wondering “hugel-whaaaa? ?” then read this post). Last year, my maiden voyage as a hugelkultur gardener was a complete and total flop. But being the stubborn homesteader that I am, I decided to give it another try–after applying a generous amount old manure, of course. (Because manure fixes everything). Apparently, the seeds loved the whole hugulkultur-thang, and they thrived. I ended up with around a dozen happy pumpkins from just a small corner of my garden. a) It’s messy to put in the pumpkin puree into the bag, and wastes a lot of pumpkin when you are trying to remove it. b) It takes up valuable freezer space. 2) It’s a bummer, but you cannot can pumpkin puree–you can only can pumpkin cubes (Holy wow… there’s a lot of “cans” in that sentence). According to the National Center for Home Food Preservation, “We have no properly researched directions to recommend for canning mashed or pureed pumpkin or winter squash, or pumpkin butter.” So yeah, that’s one area where I don’t live on the edge. The same goes for canning refried beans, which is why I just can whole beans and then mash ’em after I open the jars. Cut the stem out like you are getting ready to carve a jack-o-lantern. Cut the pumpkin into four or five wedges. 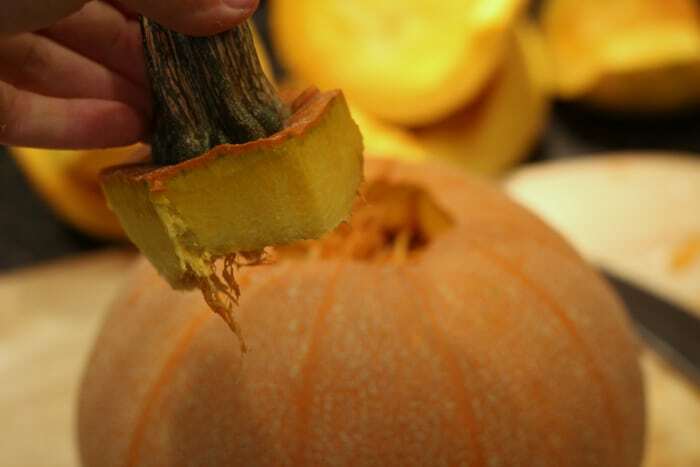 Use a spoon to scrape out the pumpkin guts. Peel the pumpkin. I was very thankful my vegetable peeler worked for this. However, if you are dealing with pumpkins with a super-hard rind, you might need a sharp knife to remove the peel instead. Watch those fingers! Cut the peeled pumpkin into (roughly) 1-inch cubes. Place the cubes in a large pot and cover with water. Cover the pumpkin cubes with the leftover hot cooking liquid, leaving 1-inch of headspace. Add lids and rings and place into your pressure canner. Process quart jars for 90 minutes at 15 pounds pressure. Process pint jars for 55 minutes at 15 pounds pressure. 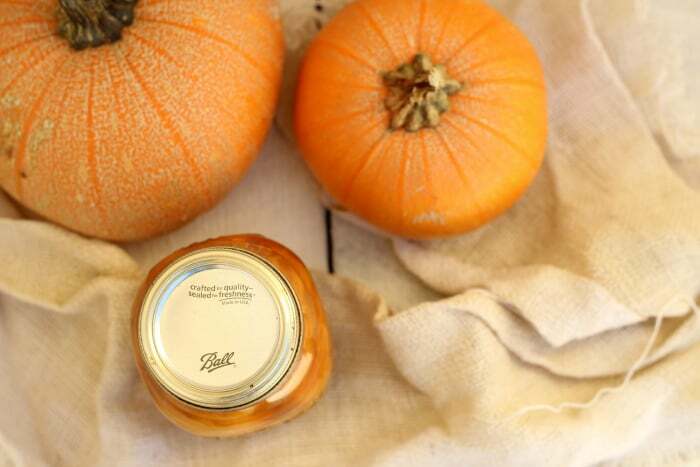 When you are ready to make pumpkin puree, simply open a jar, strain out the liquid, and mash! I found one jar of drained, mashed pumpkin gave me around 2-3 cups of puree. 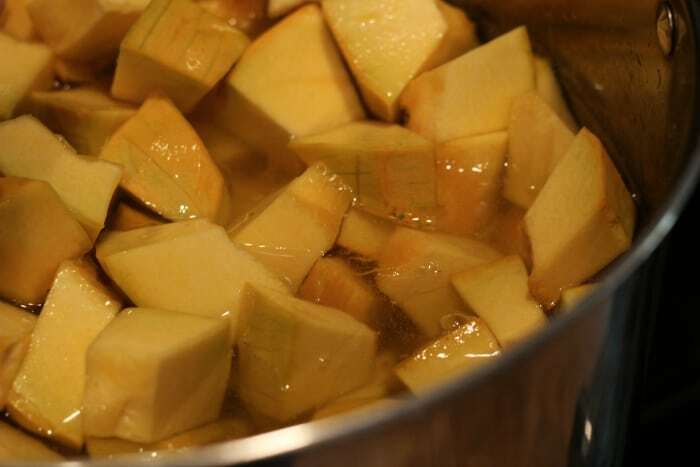 The purpose behind boiling the pumpkin cubes for two minutes is to merely heat the cubes, not entirely cook them. Avoid using carving pumpkins–the flavor and texture just aren’t the same as a good, old-fashioned pie pumpkin. 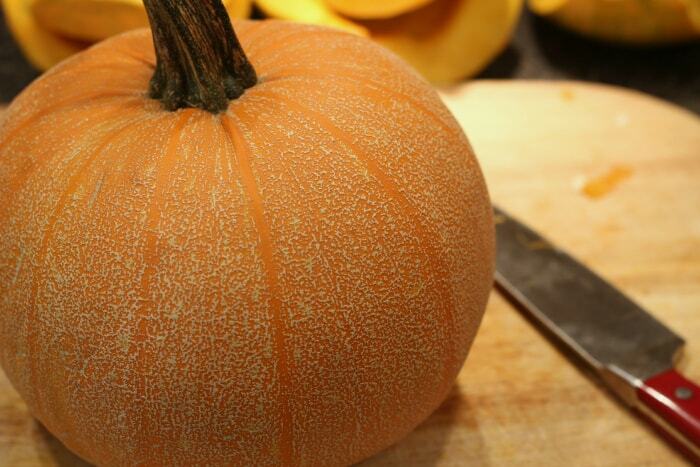 I’ve been growing these Winter Luxury Heirloom Pie Pumpkins for several years now. They are my absolute favorite! Need some fabulous pumpkin pie spice? Make it yourself! Or, use your freshly canned puree for the ultimate pumpkin pie smoothie or honey maple pumpkin bread. This is great. – I was always told you couldn’t can pumpkins so I always opted to freeze it. i agree the puree is a mess and dealing with it when it’s hot isn’t always a joy either. Glad you had success in your garden. 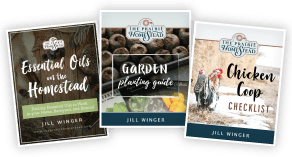 I have a direct composting tip that might help you in your garden. Stop by my blog when you get a chance. Carole said, “I was always told you couldn’t can pumpkins so I always opted to freeze it.” Every grocery store in America has pumpkin in a can… up until Thanksgiving anyway. Jill I live at around 5300’ above sea level. I know you also live “at altitude”. Is the time and pressure in this recipe already adjusted for altitude or do I need to process longer? All joking aside, what I did was bake the pumpkins until the flesh was soft enough to scrape out, then mash through a sieve like applesauce (or maybe I used the Victorio strainer, I can’t remember). Then packed it into jars and pressure cooked it according to my ancient preserving book. For the record, it was written before hot pack tomatoes (not processed at all) were ever water-bathed. I have always canned puréed pumpkin. My grandma did it and she lived until she was 98. She did, however, baked the pumpkin halves on a cookie sheet until the pumpkin skin was brown and separated from the pumpkin flesh. She took it out, puréed it and pressure canned it at 10 pounds of pressure for 130 minutes with pints and 10 pounds of pressure for 220 minutes with quarts. It looks like Libby’s pumpkin and smells like it too. As always, after the lid is popped, I smell the food for any off smells. If there is, I throw it away. I was just told on FB if I don’t get a canning book every year, study it and worship Ball, then I am not allowed to have my opinion. Like I said, my grandma did pumpkin that way for years, and a certain person on FB insulted her, my family and my culture as we are German Lutheran. BTW, my gma was the Home Ec advisor for Texas County Fair for over 50 years and she wrote the canning book for the OK panhandle for years. Yes, I know there are plenty of people who have never followed Ball Blue Book recommendations and were just fine. Once I talked to an old timer who had a Great Depression-era mother who canned raw meat with a water bath canner and wax seals– they never got sick. However, since I have a public resource here, you’ll always hear my recommendations be fairly conservative and follow the commonly-accepted safety rules. Just to clarify is the quart time really 220 minutes at 10 lbs. Join Canning Rebels thru FB…… They are awesome!!! That is awesome ! I would like to hear more about your grandmothers canning methods. Thanks for your grams technique. Glad you don’t listen to the fools. I actually found a recipe this year for canned Pumpkin Butter. 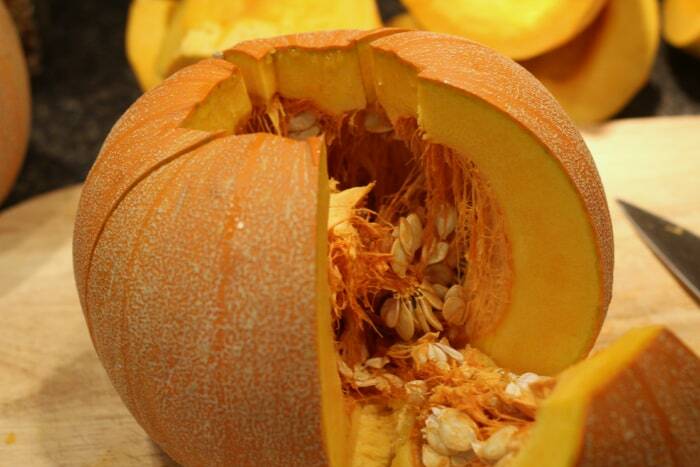 After you puree your pumpkin it requires that once all ingredients are added to cooked it to boiling for 30 minutes. Put hot pumpkin in hot jars and process for 30 minutes at 10 pounds of pressure. So far so good. I hope it stays good. I have just always been curious, why is it that we are told that we can’t can pureed pumpkin? 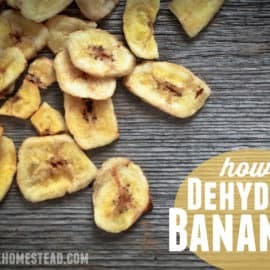 The concern is that the puree is so thick that not enough heat will reach the center, and something that could make you sick would survive the canning process. That said, one of my grandmothers used to water bath can all her vegetables – she had 8 kids, a huge garden, and put up a cellar full of food every year. 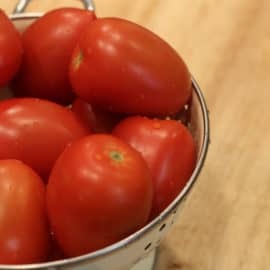 Also, I didn’t know it until recently, but my mom used to can her stewed tomatoes by filling the jars with hot tomatoes, and then just putting on the rings and lids, inverting the jars onto an old towel, and swaddling them with more towels. When they cooled, any that hadn’t sealed (very uncommon) went into the refrigerator for immediate use. Personally, I tend to follow the newer recommendations, mostly. Would you mind passing the recipe on? I’m sure five out of six people think Russian Roulette is safe too. Each year, I grow a bunch of pumpkins, but I haven’t grown pie pumpkins. You’ve inspired me to put them into next year’s garden plans. 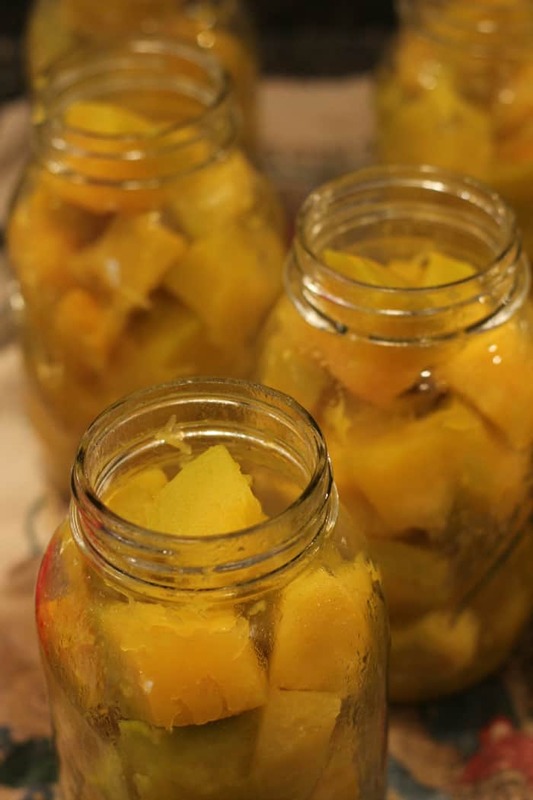 I gave up on canning several years ago because 1) There’s only the two of us (me and hubs), 2) I can’t seem to recruit anyone to help me – it’s a lot of work doing it solo!, and 3) I only had a galley kitchen that was too cramped to work in. Now I have plenty of space, so I should give it a go again. 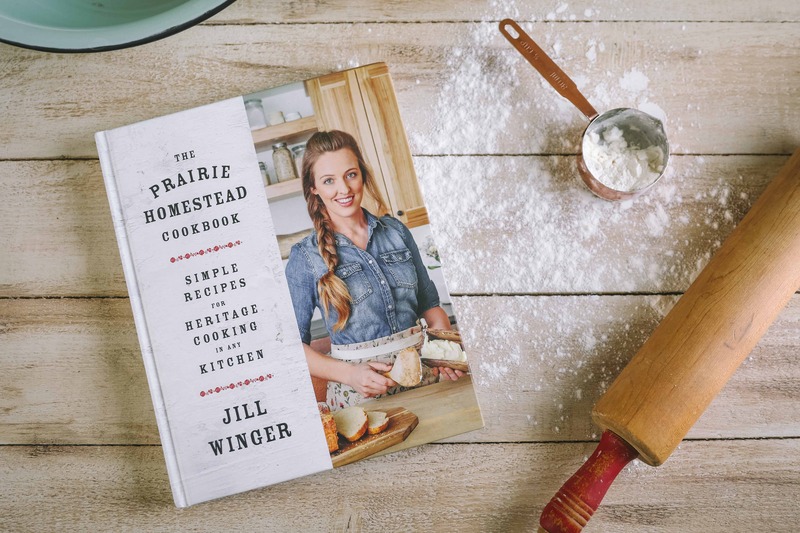 Thanks, Jill, for sharing how you can the pumpkin. I’ll keep this bookmarked. I think you’ll love pie pumpkins Cynthia! Happy canning! I buy canned pumpkin all the time…there’s obviously a way. So how do the companies that can pumpkin puree do it? What’s the problem with home-canners doing it? Is it supposed to be too dense to get properly processed in the center? Or what?? Yes– supposedly the thick purees are too dense for a home canner. I imagine that commercial canners have equipment that allows them to can things at a much higher temp. YIPPEEE SKIPPPEEEEE!!! Yes I am excited. I knew I need to peel/cube the squash but trying to figure an easy way proved difficult. I asked my friends everyone said cook it in the crockpot,microwave, oven but I knew it couldnt be cooked! This looks easy and we have a floor full of butternut. Thanks! Awesome– butternut should can beautifully! 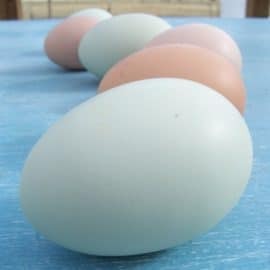 I knew that our homestead sisters in Times past would never let these tasty beauties go to waste ! Thank you for bringing this possibity back to life and save that blessed harvest ladies! I grew a winter luxury pumpkin too, but I only got one pumpkin this year so I am using it at Thanksgiving. The rest of my piles and piles of squash though, prepare for canning! 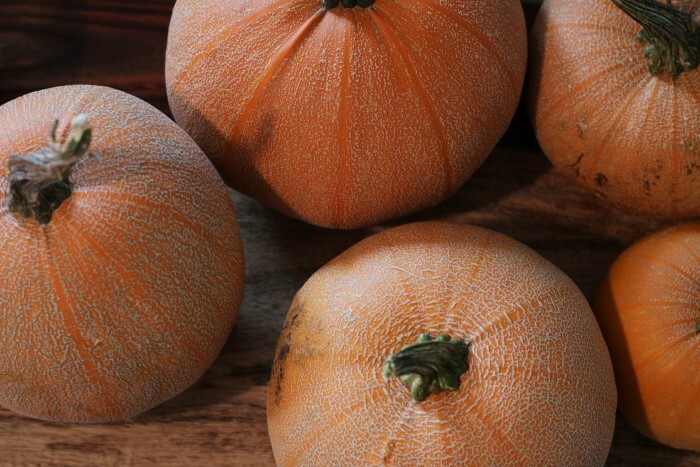 Hurray … another way to keep pumpkin other than the freezer. My chest freezer is months away and my freezer is always overflowing but I always can find “space” for cans! I’m guessing this would work for butternut squash too? Thank you for all the info you share for this city girl who feels at home on a farm. Canning pumpkins works well, but I am also hoping that i can can spaghetti squash. Has anyone tried this? I was wondering… for the quart size, after you open a can and mash the cubes, how much puree do you end up with? Most recipes I’ve got call for around 2 cups, so if a quart makes much more than that, I’ll need to reconsider what I’m trying to bake. Can I just say, those pumpkins are beautiful! Thank you so much for this article!! I’m learning to can and pumpkins are my most favorite food ever! I want to get the hang of this and try making pumpkin soup! ? Thank you again!! ? Oh yes, pumpkin soup is one of my favs. Enjoy! I have for years canned pumpkin puree and we have never gotten sick. Thanks so much for your very interesting blog. I’m quite new to your site, but am always excited when I see your posts in my email. Extremely interesting and helpful. Thank you for taking the time to do what you do. Now I want to start saving up for a freeze dryer! I’ve canned pumpkin as you have described, but decided I like freezing it better. After pureeing I measure cupfulls into those Texas-sized muffin pans. After these are frozen I place them in ziplock freezer bags. Voila, ready to use in recipes as most call for 1 or 2 cups of purée. Yep– frozen pumpkin is awesome too! Today I canned sweet potatoes the same way!!! We will have sweet potato pie for the holidays!!! Thank you for sharing that idea. 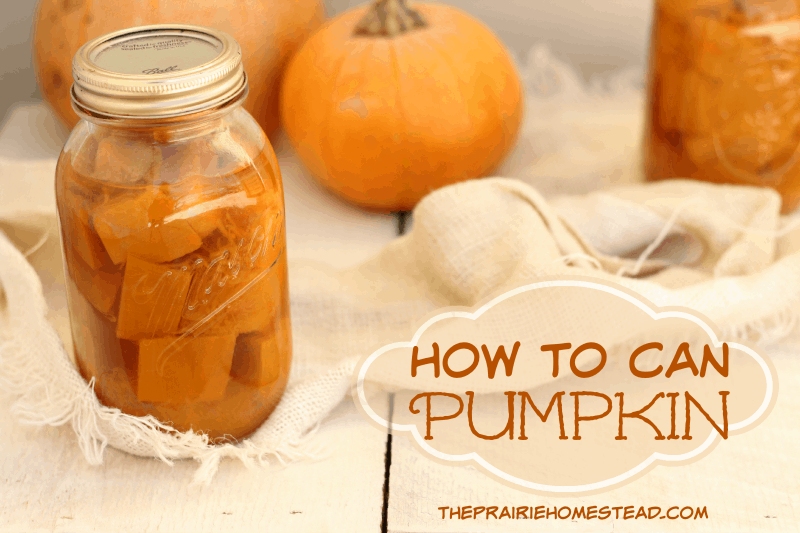 Have you ever had a pressure canned cubed pumpkin continue to bubble hours after removed from natural released pressure canner? After pressure canner cooled down and the button could be pushed down with no pressure on it. I took of the lid and within 5 minutes removed quarts, they were still bubbling but not overflowing or anything, water was clean, I removed them and they sealed within 30 minutes but are still bubbling hours later?????? Do you know If they are ok?? How long will the canned pumpkin last? Doing some for the first time just wondering when its shelf life limit would be. Thanks in advance. As long as it seals properly, it can last for years! Thank you so much for this post. For the first time our garden ran over with beautiful pumpkins. After several pumpkin pies, cookies, and oatmeal, what to do with the rest? Use up valuable freezer space? No. Pressure canning for us. We just put up 30 pints and counting. I see lots of yummy pumpkin dishes throughout the year. 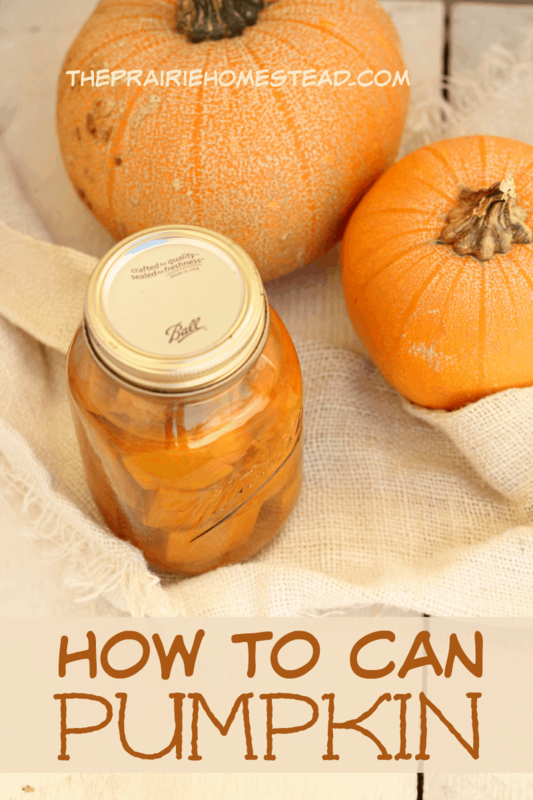 Can I use this method of canning pumpkins for Butternut Squash as well? I’m so excited to try this, too. 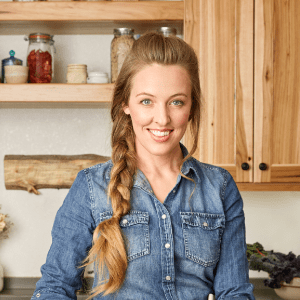 I have two freezers that are jam packed with meat & have no room for my garden veggies. Thanks so much. Ps. Just canned chicken packed in it’s own broth. First time I’ve tried that…fingers crossed…sometimes I don’t like the flavor canning imparts. I am just starting out canning with pressure cooker. Made spaghetti sauce and now want to actually make pumpkin pie filling, but all the research says not to puree. However, with that said the cubes will work, but what about adding the spices to the pumpkins before pressure canning? Is this something that you or someone you know has done before? 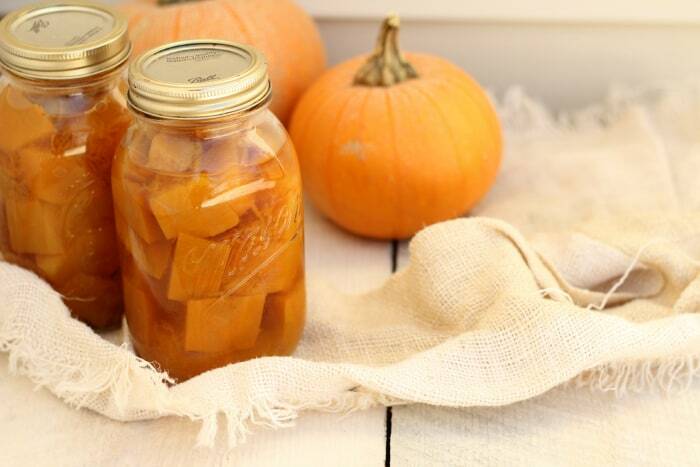 I realize that you have to drain the water out of the jar prior to pureeing, but thinking it would add flavor to pumpkins? What are your thoughts? Also, when making a pumpkin pie I have read that it is thinner once pureed, do you add something to the puree to thicken it? Thank you for your insight and look forward to canning! I wouldn’t add spices to the pumpkins when canning them. It limits what you can do with them when you open them. I prefer to flavor things like this as I am making the final product that will go on the table, because adjusting the spices then gives better control over the final taste. Can you use this method for any type squash? Like butternut, spaghetti, meat and other types I can’t remember the names to? I have cooked , mashed and canned pumpkins for years and had no problem ,everyone is still alive . The only thing I have a problem with is getting them peeled , I find it really hard ending up with blisters on my fingers . I have hot bathed the pumpkins first a little easier but still find them hard to cut and peel them. Any easier hints out there ? Like others I baked my pumpkin, then canned. Past 4o years used this method. Cooled and put in jars in chunks. Did not waste purée time because used blender to make pie. One pint made a 9″ pie. Do you have to use pie pumpkins? I just picked some smaller pumpkins up at a local farmers stand and was going to use them. Ok, gonna give it a try. I am new to pressure canning. So far have only canned meats. But since the occasion arose for pumpkins, I am gonna try it cubed. However, I have read the pressure is determined by your sea level. I only need 11 lbs, but since you said 15, I’m gonna do a little more pressure than usual. I would try the puree but not into the extra work right now. I am going to time it for 90 minutes as I have read for vegetables. You have opened my eyes with different things that can be processed. THANK YOU VERY MUCH. I bake mine and let them cool completely. The skins peel right off. My grandmas didn’t ever can pumpkin unfortunately. They canned everything else though. Living through the depression made “Waste not- Want not” words to live by. I canned a bunch of pumpkin chunks last fall and some of the pumpkin has spots on them. Is that normal? 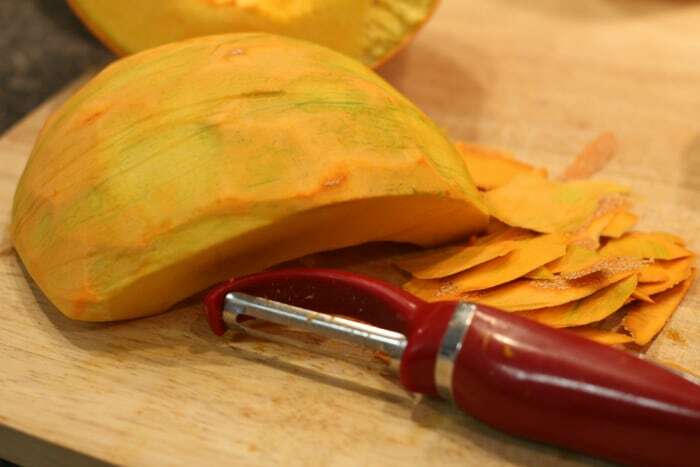 I’ll use any pumpkin or large squash like a hubbard, flavor may be a little different, but I still enjoy the taste. On a dare, I even made pumpkin pie from the little ornament pumpkins. Turned out great, though it was a bit of a labor peeling and cleaning the little things. Nice! So the ornamental pumpkins still had good flavor? I make my own paste for pies or breads just like I do jams. We are all ok. I process many things and put them in jars, boiling jars, lids and rings. MAKE SURE you use very sterilized dish rags too and if you are not sure they are germfree, just dip the rag end in a pot of boiling water and let it stand for a few minutes, it will cool down enough to handle and wipe the jar top very clean before you put on the very hot lid with the tongs. 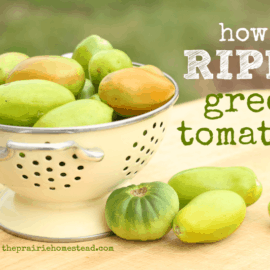 I usually have to throw away one or two jars a year and I can about 200 jars of various fruits, veggies, soups, pie fillings, jams and meat sauces. 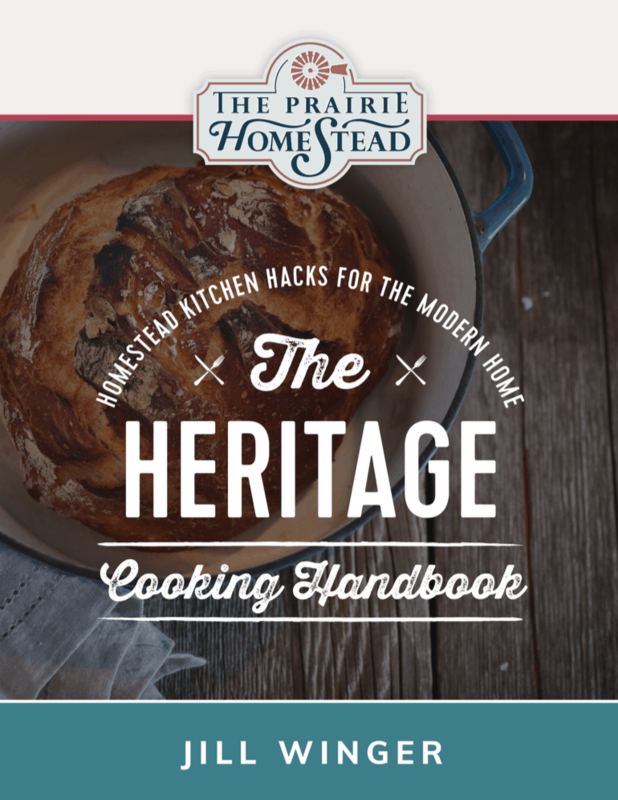 I have never used a pressure cooker and I am 77 and have been canning for at least 50 years.